Border Police find marijuana greenhouse in southern Israel. 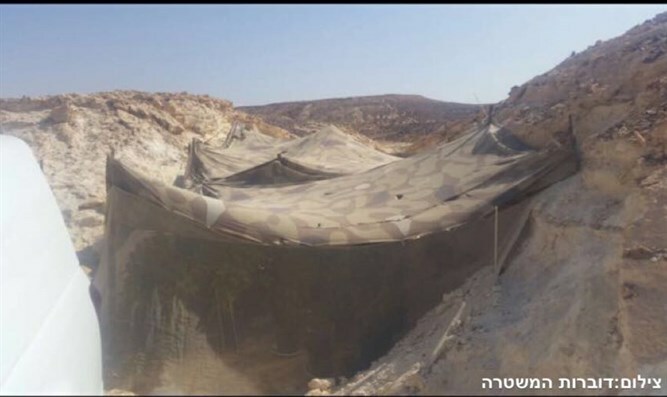 Border Police officers discovered a camouflaged marijuana greenhouse in the Arava-region town of Shitim. During a search, the officers noticed marijuana sprouts receiving water from a large container camouflaged nearby. When they came closer, the officers noticed 200 mature marijuana plants about to be harvested, for a total crop of 7.6 kilograms. The officers took apart the greenhouse and transferred the findings to Israel Police. According to the operation's commander, the greenhouse's location and the way it was camouflaged prove the criminals were trying to hide their activities and their involvement in growing and selling drugs. "During our operations, we invest a lot of effort in searching large areas with advanced technological tools intended to locate greenhouses," the operation's commander said.